I've been very lucky recently and have spent two evenings eating very delicious food cooked by one of the loveliest chefs I've met. 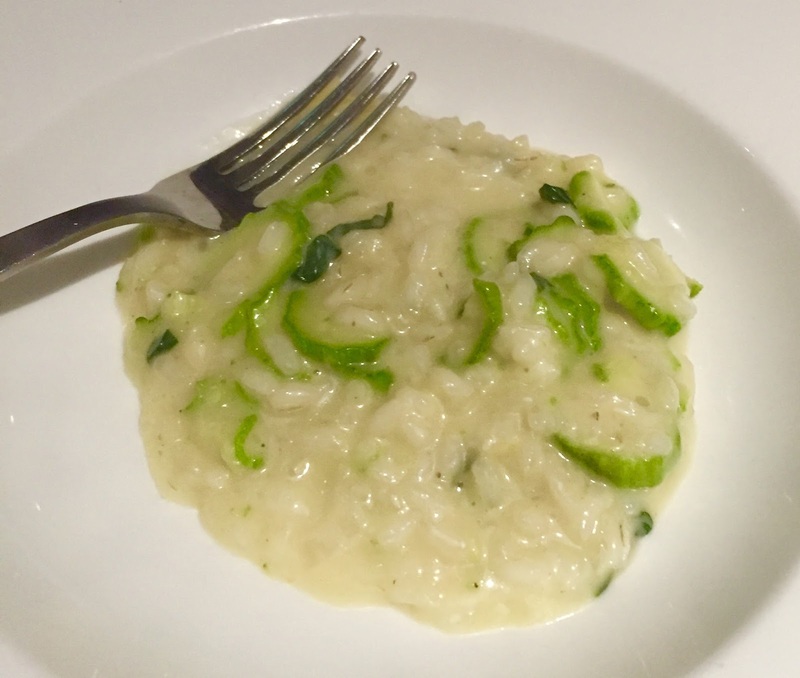 A couple of Tuesdays ago was my Theo Randall experience part 1 at The Intercontinental in Mayfair where I was invited for drinks, a cooking demo by Theo and a sit down four course dinner. This was followed by a very different evening the next Tuesday at his new restaurant, Theo's Simple Italian in Earl's Court, which I'll write about in a separate post. So back to Theo part 1. A group of lots of lovely bloggers and I were invited to the newly refurbished Theo Randall at the Intercontinental. We started with drinks in the stunning bar area which has undergone a significant redesign to incorporate a sommelier’s table, where all the garnishes, bitters and mixers for the cocktails are kept. 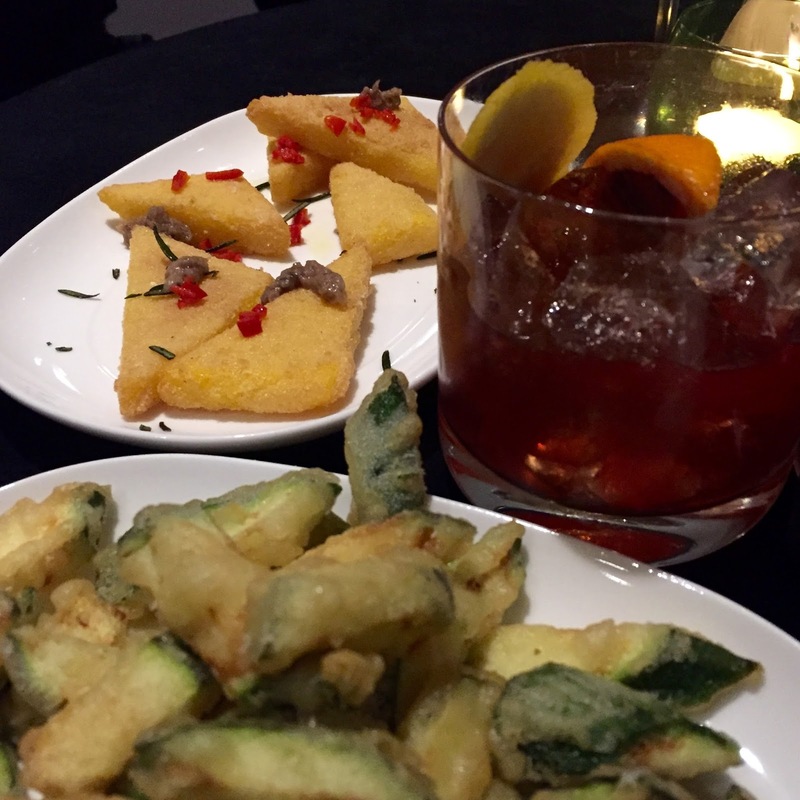 There's a revised bar menu which offers authentic and innovative Italian cocktails, including my absolute favourite, the Negroni. And the InterContinental's Negroni is one of the best I've tried. The perfect balance of bitter, citrus and punchy, I could drink far too many of these! If you want to go for drinks at the bar there's also a few small dishes and antipasti so you can go just for drinks and nibbles. But that would be silly with all the delicious main food on offer! We headed through to the smaller of two private rooms where Theo demonstrated how to cook the perfect risotto - don't use butter to start with (it'll burn), you don't need wine if you have good stock, be generous with the stock and use the freshest of vegetables that have been pre cooked so they don't bring the cooking temperature down in the pan. Whilst he was showing us this we nibbled on deep fried polenta with chilli and anchovy, which may well be my new favourite snack, and battered courgette slices. 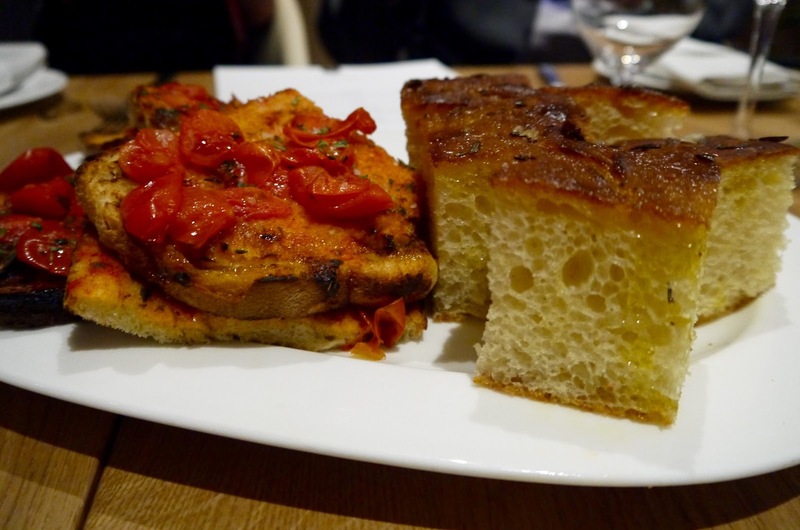 We were then seated, ready for our main meal which was a showcase some of the new additions to the menu starting with delicious breads - dangerous as if the bread is good I'll eat too much and fill up on it. I tend to generally not eat bread but when it's this light, fluffy, salty and tasty it's hard not to! 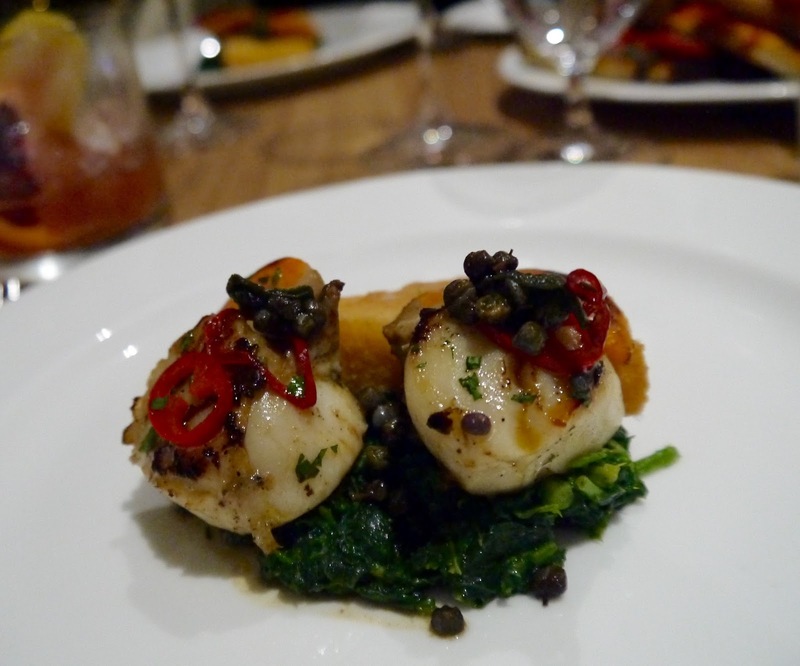 The first proper course was pan fried Scottish scallops with sage, chilli, anchovies, herbs and vinegar with fried polenta and braised cime di rapa. The scallops had caramelised edges but were soft and bouncy inside and expertly seasoned by the sage, chilli and anchovies. Everything just tasted so fresh, like it had just been plucked from the sea or the earth. Theo's love of Italian food and cooking came from childhood holidays spent in Italy, and if you run an Italian restaurant then the pasta has to be perfect, which of course it was. 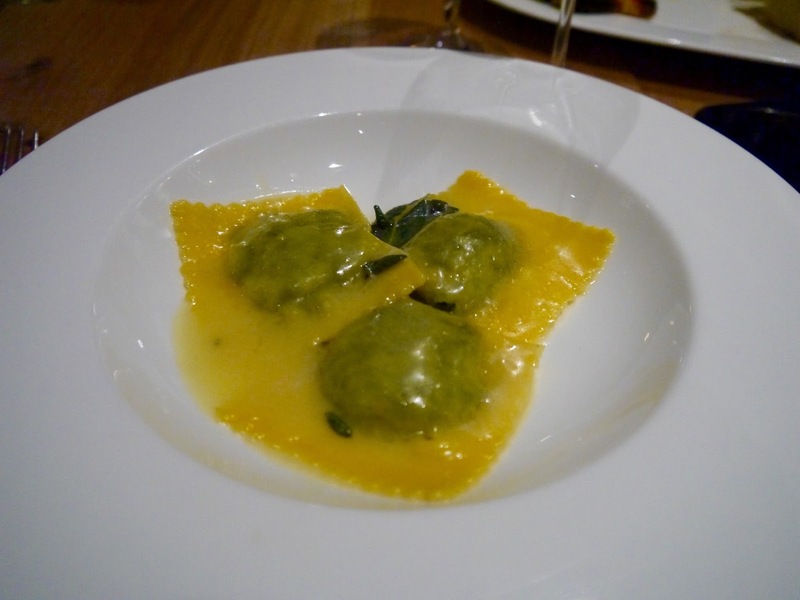 Little eggy ravioli pillows bursting full of mixed greens and sheep's ricotta, with an excellent sage butter﻿ sauce. There was nothing fussy or showy because there didn't need to be - it would've spoilt such a good, straightforward dish. 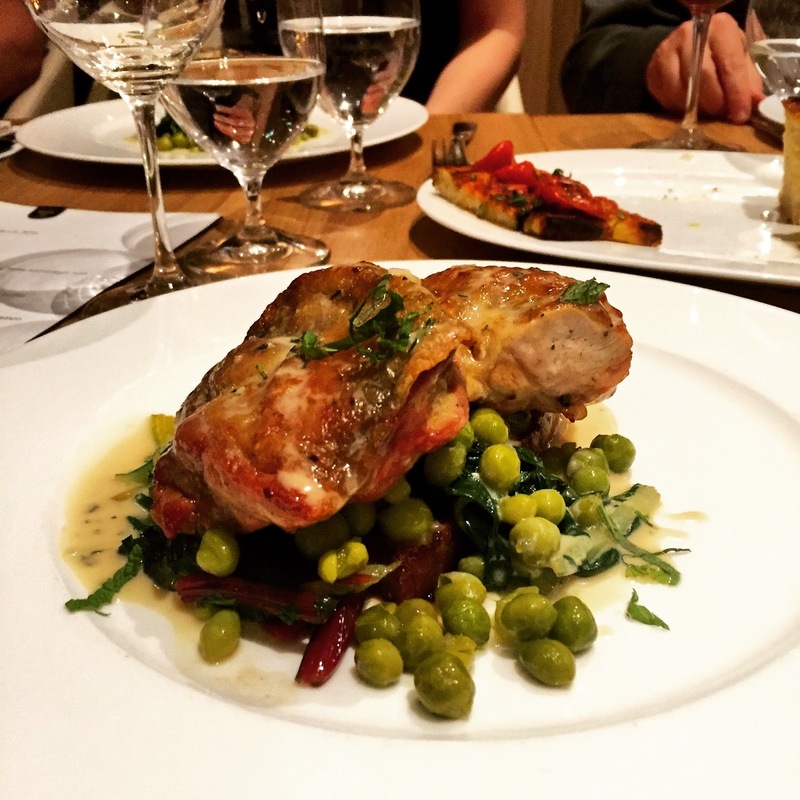 The actual main course was huge - wood roasted guinea fowl stuffed with prosciutto di Parma, thyme, lemon zest and mascarpone, on pagnotta bruschetta that was spread with liver, with new season Italian peas. Again, just so fresh and vibrant - every flavour was discernible without overpowering the others and the whole dish was harmonious. 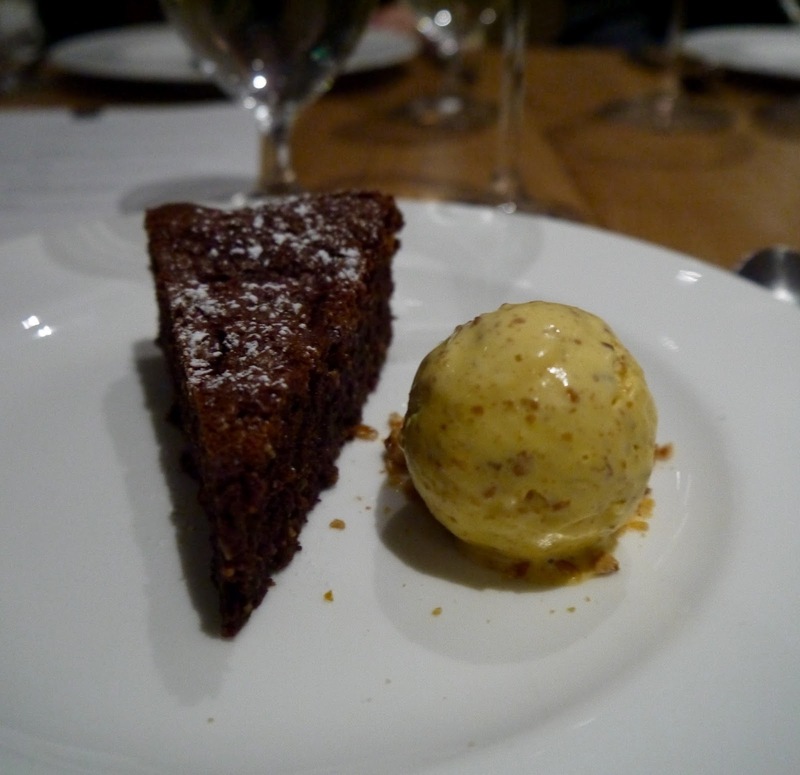 Finally we had torta caprese with roasted almond ice cream - an almond chocolate tart that was so decadent and that I couldn't manage much of - you know me and my pudding intolerance/greediness for all the other dishes! The ice cream was heavenly though with such a strong essence of caramelised nuts. Each course was served with an exquisite Italian wine pairing chosen by head sommelier Vittorio Gentile. Theo Randall at The Intercontinental is the only restaurant where the wine menu is chosen based on and changes because of the seasons, so we tried some gorgeous, bouncy Spring wines to go with our food. I thoroughly enjoyed our evening, and highly recommend that if you haven't been, then go, and if you have been, then go again, and sample the new and improved menu in the new and improved surroundings! And if you want to learn from the man himself you can book a similar masterclass and meal to one we did here. Yummy! That risotto looks fabulous. Drooling at that almond chocolate tart and icecream.